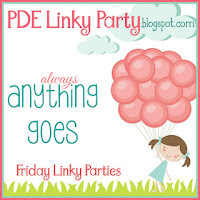 Today, we have a new PDE Linky Party "Anything Goes" challenge going on. We hope you come join in and link up your projects you are working on. 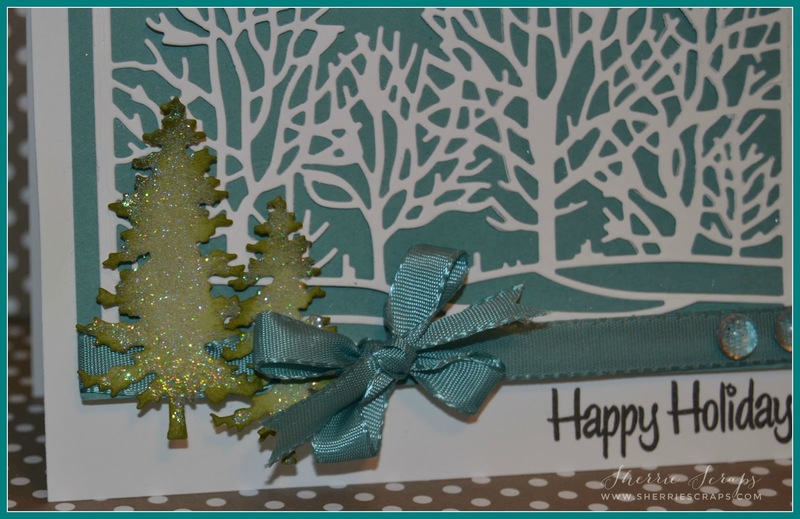 Today I am sharing a quick and easy Christmas card that can easily be mass produced! I began with a white card base, followed by a base layer of SU Lost Lagoon. The next layer is created with the Taylored Expressions~Seasonal Trees die. I happen to find these awesome dies when I was at a scrap retreat a few weeks back and I just love them. 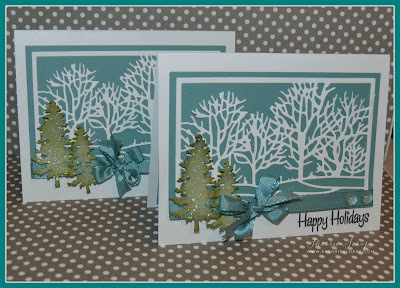 The two tree's in the corner are also from Taylored Expressions~Evergreen die. They are distressed, glittered with sparkling ice and popped up with foam tape for some dimension. I stamped the sentiment with Pretty Cute Stamps~Christmas Cheer stamp set. I tied on a pretty double bow with Lost Lagoon ribbon and added a few little skittles in the corner from Carri at DoubleClick. This is really just super pretty! Ohhhhhhhhhh this is gorgeous! LOVING the trees!!!!!!!!!!!!!!!!!!!!!!!!!!!!!!!!!!!!!!!!!!!!! This is absolutely gorgeous, Sherrie!! I have a slight...okay, huge tree die obsession so this calls to me!! I love the sparkly trees in the corner!! They look amazing!! The colors and details are so beautiful!! Stunning card my friend!! Thank you so much for playing along at DL.ART!! I love these cards. They are so beautiful! I love this holiday card!! Beautiful & Elegant!! Pretty pretty cards. Love the colors. Beautiful card, wonderful color combo. Oh this is so pretty! I love the colors and the added sparkle. Hope you are having a wonderful Thanksgiving with your family. Lovely card Sherrie! Love the sparkly evergreen trees, and pretty background. Beautiful card Sherrie. Love the design and the colors. This is so pretty Sherrie, I love the colors. Beautiful card Sherrie! The scene you created looks so peaceful and beautiful! I hope you had a wonderful Thanksgiving! Such a beautiful card Sherrie! 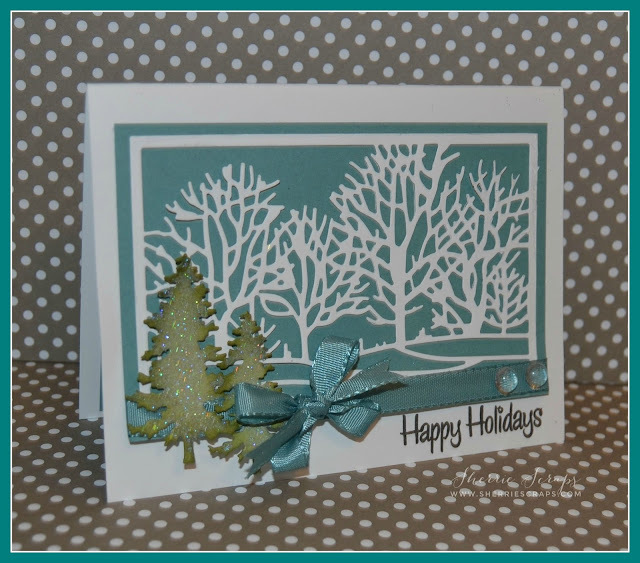 I love the little snowy scene and love those sparkly trees!!! Very calm and peaceful... lovely job my friend. I hope you had a wonderful Thanksgiving holiday and are having a great weekend! Wow Sherrie! This is gorgeous! I love the beautiful scene that you created! The trees look stunning! Love the shimmery ones! Hope you had a fantastic Thanksgiving! Stunning! Hope you had a wonderful Thanksgiving! What a beautiful card!!! I love it!!! Really pretty.......love the beautiful scene you have created, love your card! This card is sooo beautiful and elegant!!! I love the colors and the sparkly trees!!! Love this card!! Have a great day. Ooooh I love these cards! 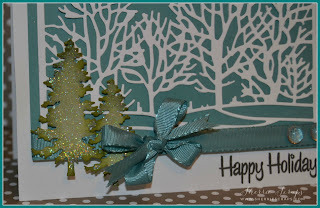 The colors are just gorgeous and the tree die cuts are FABULOUS! Sherrie ~ GORGEOUS! Seriously just GORGEOUS! The white and blue with a pop of green is just beautiful! 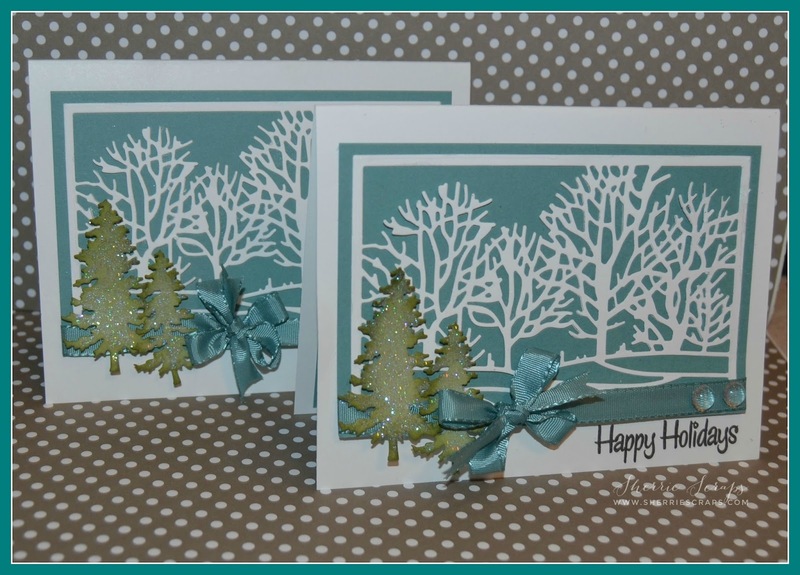 What a gorgeous set of cards Sherrie!! I just LOVE the color combo!!! Beauty and elegance my friend. Love the way the trees pop.